Wayne Henderson makes highly sought-after guitars in his shop is in southwest Virginia. Wayne and his guitars need little introduction these days. Having built for an army of the best players in the world, both in the southeast where we live and for big names like Eric Clapton, his guitars are now legendary. But why? Tone, that's why. No maker reaches the highest levels without killer tone. The D-18 style Mahogany guitar offered at auction is his most popular seller. The spruce top gives its all. It is loud and clear as a bell. Some of Henderson's instruments are intricately decorated but are most respected for their volume, tone, and resonance. Blues guitarist John Cephas said that Wayne Henderson "is probably the most masterful guitar maker in this whole United States." There is a long waiting list for Henderson's guitars made up of the "famous (and not-so-famous)". Wayne's guitar playing has also been enjoyed at Carnegie Hall, in three national tours of "Masters of the Steel-String Guitar", and in seven nations in Asia. He is a recipient of a 1995 National Heritage Award presented by the National Endowment for the Arts. Wayne builds about 20 instruments a year, mostly guitars. The fiddle that Jimmy Edmonds is crafting for the Masters Auction is made of Curly Maple wood from Southwest Virginia. The fiddle top is made from Red Spruce from White Top Mountain. Jimmy learned much of his craft from his dad who was one of the most unique builders he had ever seen. His dad was always trying to build something different than anyone else. Jimmy worked with his dad to create some great instruments and continues to use many of his tools and ideas today. Jimmy started making fiddles in 2001 and guitars shortly afterwards. Being a fan of Martin guitars he basis his guitars around Martin but does not copy every detail. He wants his guitars to have their own look and he strives for that old Martin 30's sound. Jimmy, a child prodigy on the fiddle, has continued to grow in both playing and crafting fiddles. He now custom builds guitars for some of the top musicians in the industry. 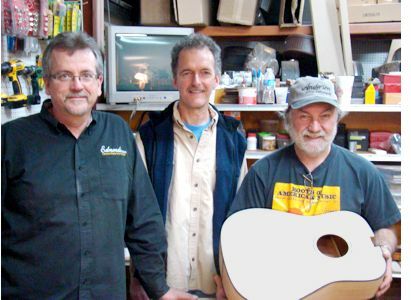 Jimmy's shop Leaf and String, LLC is located in downtown Galax, VA.
Gerald Anderson and Spencer Strickland are two friends who are master musicians and master craftsmen. Their HoustonFest Mandolin to be auctioned is an "A" style mandolin made with Grayson County Maple back, sides and neck. Ebony fingerboard, bridge and peghead and a Whitetop Mountain red spruce top. It is truly a remarkable looking and sounding instrument. In learning the craft of luthering, Gerald apprenticed with Wayne Henderson and worked in his shop for 31 years. Spencer followed by apprenticing with Gerald in mandolin making through the Virginia Folklife Apprenticeship Program at the Virginia Foundation for the Humanities. Since the apprenticeship, Anderson-Strickland Instruments have become greatly coveted by musicians throughout the region and the country. Anderson-Strickland has also come to signify the name of the performing duo gaining popularity for its clear, searing instrumentation and soulful vocal harmonies. Much like Wayne, Gerald became known over the years both as a fine luthier and as a gifted musician. Gerald's crowning achievement was winning the prestigious Guitar Contest at the 2003 Galax Old Fiddler's Convention. Spencer's playing developed quickly and in 2004 he became one of the youngest contestants ever to take home the coveted title of "Best All-Around Performer" at the Galax Old Fiddler's Convention. He later won the mandolin contest at Merlefest. Steve Huber is crafting a new banjo line the "Heritage Banjo" for HoustonFest 2012. A Huber banjo was the choice of Houston Caldwell for whom HoustonFest is named and dedicated. Steve is the driving force as well as fearless leader of the Huber Banjo's team. He has played the banjo since he was in his teens, and performed professionally for many years, both before and during his tenure at the Huber helm. In addition to his skill and experience as a banjo player, Steve also has extensive training in mechanical engineering and a work history in the manufacturing of metal components before launching his company. He first stepped into the banjo business with the introduction of his Huber Vintage Flathead tone ring in 1998, following that a few years later with the introduction of the first Huber Banjos. Steve searched deep into studying the older flathead banjos, especially those made prior to 1942, to develop an understanding of what made them so much richer and more responsive than newer instruments. His first quest was to find the alloy used for those tone rings, figuring that any new banjo that sought to deliver the "pre war flathead sound" would need a tone ring that was not only identical in specifications and dimensions, but also in alloy composition. Once Huber was convinced that he could consistently turn out a pre war replica tone ring, his attentions turned to building banjos. In much the same manner as he had researched tone rings, he studied every aspect of these vintage flathead banjos to find out how either the component makeup, or the manner of assembly differed from current standards. The resulting banjo has been met with much acclaim. For tickets & more information on HoustonFest 2012 and the Masters Auction go to www.HoustonFestGalax.com, e-mail: HoustonFest2011@yahoo.com, or call: 276-236-9908. Ticket outlets in the Galax area include all Grayson National Bank locations, Roy's Diamond Center, Barr's Fiddle Shop, and the Galax Visitor's Center.